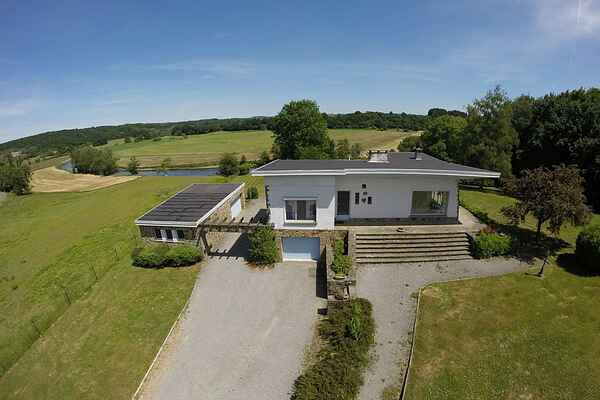 This lovely villa is situated in Noiseux, nine kilometres from Durbuy, offering a truly magnificent view over the river Ourthe. The spacious luxurious villa is decorated with a lot of attention to detail. From the lounge area, with its large windows, you have a beautiful view of the Ourthe river and its valley and forests. But the view of the river Ourthe is also breathtaking from the Jacuzzi on the terrace in the garden. After a day outdoors you can also find relaxation in the sauna. In the recreation room you can enjoy a game of air hockey or table football. Would you prefer playing a game of darts? Any energy left? From the villa you can step right into the canoe for a beautiful canoe trip on the river Ourthe. This holiday home is aimed at families. Sporty holidaymakers can go mountain biking, kayaking, hiking, biking and cross country skiing in the area. And of course you will visit Durbuy (9km), the smallest town in the world and the world famous caves of Han (28 km). Or enjoy a delicious Belgian beer in the famous brewery of Ciney (24 km).